Stage 1) Cut at this stage in the field to decrease petal damage. This is the first stage of the Sunflower, which we call "Tight." 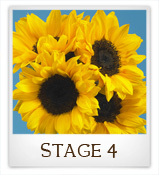 - When received at this cut stage the most important action is to re-cut the Sunflower and put the flower in a vase/bucket that has at least 5 inches of fresh water. - Takes approx. 2-3 days to go from Stage 1 to Stage 2. Stage 2) This is the second stage of the Sunflower cut which we refer to as the "Opening Stage." Be prepared to have stems within the bunch open inconsistently. - When received at this cut stage the most important action is to make sure the vase/bucket has fresh water (must be changed every 2 days) and is maintained at a consistent temperature (between 55º - 70º F). - Takes approx. 2-3 days to go from Stage 2 to Stage 3. 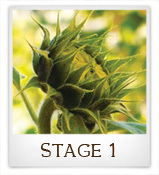 Stage 3) Ideal Stage for Sunflowers as they should have a more uniform cup-stage appearance. 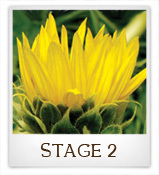 This third stage is known as the "Blooming Stage." - Make sure water has been replaced from initial uptake (Stage 2) and re-cut to accelerate opening stage. - Takes approx. 5-7 days to go from Stage 3 to Stage 4. 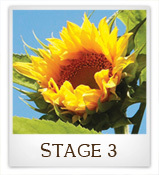 Stage 4) This is the fourth and final stage of the Sunflower and is subsequently named the "Open Stage." Once it reaches the full blown state, petals will begin to fall off. - When Sunflowers reach this stage, they should be kept in low to moderate temperature (55º - 70º F), so they last longer and age less quickly. - Takes approx. 2-3 days before petals start falling off.